Hip hop artist Rebelz (right) along with DJ Ideal Soundz (left) led a raucous good time April 11 at St. Margaret Alacoque Church in Essington. The Blessed Sacrament is displayed for adoration at St. Margaret Church, which became a worship site after the parish’s merger with St. Gabriel Parish in Norwood last year. 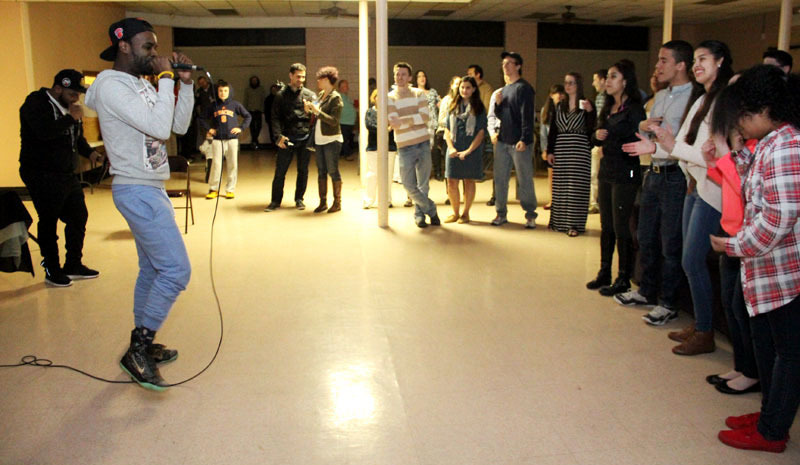 Catholic Underground’s goal of helping the Catholic Church engage with contemporary culture got a big boost with a “coffeehouse”-style gathering around Eucharistic adoration and a hip-hop concert on Saturday, April 11 at St. Margaret Mary Alacoque Church in Essington. The Manhattan-based group All is Love put a Catholic twist on what has become one of the most popular styles of music to emerge in decades. 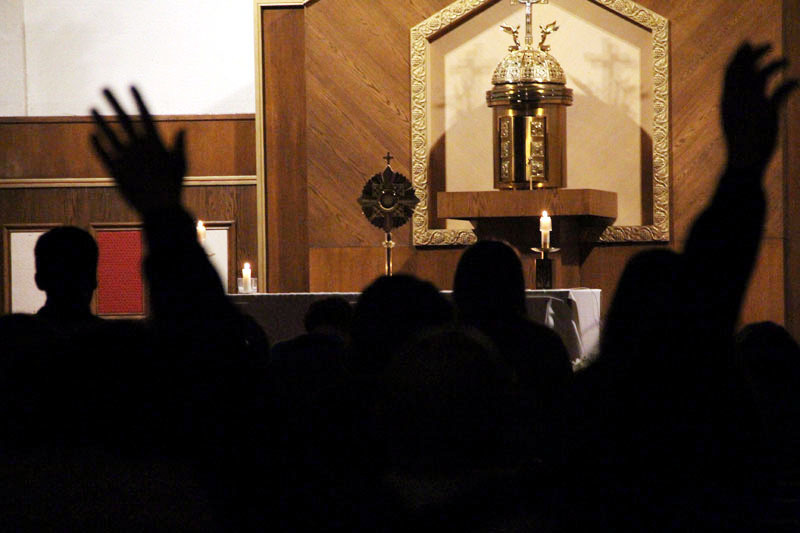 Catholic young adults from across the Philadelphia region began the evening with vespers prayer and a folk band providing music during a holy hour in the presence of the Blessed Sacrament. It ended with benediction, led by Deacon Gary Guy. The permanent deacon serves at Our Lady of Fatima Parish in Secane. Catholic Underground is a movement begun by the Franciscan Friars of the Renewal in New York during the late 1990s as a response to the call of St. John Paul II and Pope Benedict XVI for Catholics to be in conversation with the culture. The Philadelphia affiliate of the movement began in 2007 but has dwindled recently. Its revival is beginning in Essington, Delaware County, with an unofficial Catholic Underground status. The former St. Margaret Parish merged last year with St. Gabriel Parish in Norwood. The second part of the evening raised the energy level with the coffeehouse performance, something Kory Barnas, parishioner of Our Lady of Peace in Williamstown, N.J., enjoyed the most. Melvin Windley, a member of the band All is Love, ties the message of faith with his music and especially the theme of mercy. “Do it with purpose and put prayer at the center,” he said, echoing St. John Paul’s call for artists to use their talents to engage the culture in the new evangelization. “Sometimes we don’t know how we can encounter one another in this world,” Windley said. The band encouraged those gathered to join in fellowship as their songs drove a message of Christian faith. As the evening came to an end, All is Love came back for an encore. Instead of performing an additional song, they asked everyone to gather for prayer. Attendees came together holding hands, bowing their heads and closing their eyes. They offered a prayer for the intention of mercy and love. word in action hoping for great success any recordings for sale copies of music and lyrics? Hey Frances! So sorry for the delay response.. Yes there is! check it out at: Rabelzthemc.com – Thank you & God bless!